Nearly every health care professional, fitness expert, and nutrition plan emphasizes the importance of including more fruits and vegetables in your diet. These foods are the most nutrient dense, very high in antioxidants, high in fiber, shown to prevent disease, and still more health benefits are being discovered for them all the time. Despite this few of us actually get the recommended 5 to 10 servings of fresh, raw fruits and vegetables each day. There are many reasons for this, but I'm more concerned with a solution. Taking vitamin and mineral supplements won't cut it, because it is not as bio-available as real food. "Greens" products have some health benefit, but most of them still consist of several extracted and processed nutrients from different sources mixed into one product, and we assume our body will know what to do with it. 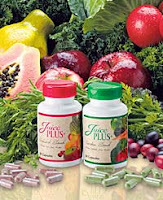 JuicePlus+ is the only nutritional product I am a distributor of (and I have been offered to sell MANY products! ), because it is the only one I KNOW everyone will benefit from. Let me know if you have questions about it.